Fuel Capacity : 1660 gal. Every system has been redone, stabilizers rebuilt, new toilets and vacuum pumps, vacuum tanks, port lights resealed, new batteries and battery chargers, skylights resealed, all operational systems on the boats have been renewed or replaced. American Custom Yachts did all the work or specialized subcontractors were brought in. It has a recent survey, been recently painted, and all mechanicals have recently been done. This 68' Tollycraft pilothouse Motor Yacht, ISLAND SPIRIT, built in the US Pacific Northwest was the inspiration for later models from Marlow, Offshore, Outer Reef, Fleming and other builders of traditional designs. 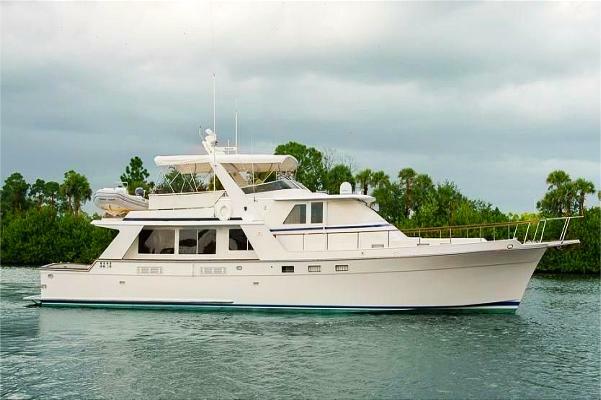 With a galley open to the large main salon, traditional teak interior, three staterooms and a large aft deck it will appeal to the traditional style buyer at a more attractive price mark. Originally built as a 61' Tollycraft the yacht was returned to the Tollycraft yard to be extended for a larger aft deck and flybridge boat deck. The result was a bigger covered aft deck area on the main deck level, and also extended full capacity to 1660 gallons to increase range. Salon Entrance to the salon with interior wood of satin finish teak is from traditional varnished teak double doors from the back deck. Leading into a large salon open to the galley, there is a large L-shaped couch to starboard and two barrel occasional chairs and light table opposite to port. Aft from the couch is a desk area and the entertainment center. The television is hidden behind raised panel teak doors. The desk has a window facing the aft deck and plentiful storage areas. A teak cocktail table with a high gloss finish is adjustable for low cocktail height or higher for dining. The couch can seat six or seven persons and has storage below the cushions. Buffet /wet bar with liquor and glass storage with icemaker. Entertainment center cabinet includes 19" stereo color TV with remote, component stereo system with speakers in salon, pilothouse, cockpit and bridge. Hi-lo cocktail/dining table (teak). Lights, indirect and direct with local switching (12 and 120 volt). Mini-blinds with lined drapery panels. 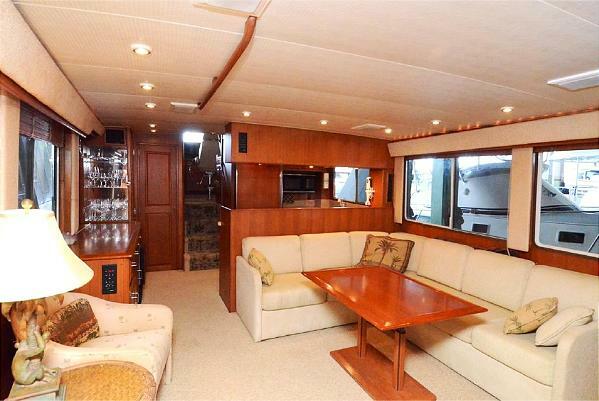 Settee, built-in, "L" shaped Custom desk and bookcase starboard, aft China closet and pantry port, forward Galley. The galley is forward and totally open to the salon so that whoever is preparing food is part of the action in the salon. There is also a good view of the television this way. The galley is "U" shaped with the full size refrigerator with freezer below is forward, and the full size stove with full size oven is aft. So once again the chef when at the stove can see into the salon. The counters are Corian style with ample work area. The double sink is below the starboard window that actually opens. The floor is teak to add to the richness of the teak cabinets and the refrigerator has teak panels on the doors to match the rest of the galley. A Real refrigerator freezer, a real stove with real oven, real full size under cabinet microwave, a real apartment size kitchen on a boat. Across from the galley is a large pantry. The wet bar with liquor and glass storage is here also. with the computer and IPad, also a connected movie hard drive, iTunes and a projection TV. The boat also has a KVH antenna, operated from the salon. A few steps up leads to the fly bridge, and a few steps down lead to the staterooms. Chart drawers. Helm chair, Pompanette Naiad stabilizers. Bow thruster. Kenwood VHS ACR spotlight. Settee with table. Windshield defroster. Furuno 72 mi. 12 kw radar. Raytheon RC 831 Chartplotter. Raymarine depth recorder. Raymarine autopilot. Standard Horizon VHF. Interphase twin scope dual axis scanning sonar. Satellite TV. Dome antenna. The flybridge is oversized. When the aft deck was extended at the Tollycraft factory, the cover over the aft deck was extended as well to give room for the inflatable tender as far aft as possible, and still have a large entertainment area aft of the two flybridge bench seats. The skipper has a good helm seat and there is a second helm seat to the side so the admiral has a good view, and can help with being on watch. There is a two part Bimini from over the windshield to the radar arch and a second Bimini over the open deck area. The tender a 14' Caribe needs new air tubes; it is showing its age. The engine is a 60 HP four stroke Yamaha. The tender is included but it is not represented as in good condition. Bench seating Control station, upper helm, with hydraulic steering, MMC electronic clutch and throttle controls, rudder angle indicator, full instrumentation and compass, remote mmc device Davit, low profile with 12 volt winch Deck lights Handrails, teak Pilot seats (2), Pompanette Custom freezer, 15 cubic feet, cold plates 2 Radar antennas, Furuno 1 Furuno radar, 24 mi. 1 Furuno color video sounder Chartplotter Standard Horizon VHF ACR 120 spotlight (repeater) Raymarine I3470 (repeater) Dataline central depth indicator. The three staterooms are accessed from the pilothouse down a curving staircase. The ships electrical panels are here so that you can have the panels at eye level when going down the stairs. So much nicer to sit on a stair and look for those breakers and switches without getting on your knees or bending over. At the bottom of the stairs are the washer and dryer. Master Stateroom is located mid ship. There is less pitching here when underway into a head sea, and no noise of hull slap on the bow if at anchor or with the bow into the breeze at the dock. This is the widest part of the boat and with a 17' 8" beam so there is good room in this cabin. The wall behind the queen size walk around centerline berth has mirrors so this helps give an impression of an even larger space. The ensuite head has a shower large enough to actually move around in. The VIP Stateroom is forward with a queen centerline berth. The third stateroom has twin berths to either side of the cabin with storage underneath. Detroit Diesels 8V92, 735 hp. 350 and 1000 hours SMOH Belt covers, engines Bilge blowers, 4" (2) Bilge pumps, automatic (5) Common drainage system for sinks, showers and deck, transom discharge Dockside telephone/television receptacle, port or starboard with interior outlets, phone (6), TV (2) Fire extinguishing system, Fireboy Fuel tank crossover for port or starboard fueling Fuel water separating filters, engines and generator Fuel and water level indicators Generator, 20 kw diesel with Onan sound shields (2300 hours) Generator, 8 kw diesel (FWC) with Onan sound shields (3130 hours) High water alarm, bilge Hullside pressure water inlet Lights, 12 volt, fluorescent Mufflers, engines and generator Oil change pump systems, main engines 12 volt, generators 12 volt Propeller shafts, 2 ½" stainless steel Rudders, stainless steel post and molded urethane Seacocks, intake water valve Sewage holding tanks with 12 volt macerator pump for waterline discharge, deck discharge and "y" valves Shorepower receptacle, 50 amp, 240 volt (2), 120 volt (1) with cords, aft location starboard, forward location port Sound insulation Strainers, intake water, engines and generator Struts, bronze with Cutlass bearings. Anchor, Bruce 75 lbs, 300' chain, chocks and deck pipe Anchor, windlass w/power up and down Bow and stern staffs Bow pulpit with rail Cleats, 4 each side Deck lights, 12 volt Decks, non-skid Electrolysis bonding system Feature stripes, cabin, bridge and boot Gunwale guard, stainless steel Handrails and rail fittings, 316L, stainless steel Hardware, stainless steel and chromed brass Horn, compressor type Shaft storage tube Trim tabs Forward washdown lazarette Spot/flood light Weather covers for bridge, console, settee and pilot chairs 2 Side deck door.